I Got A Copy Through: I won it! Blurb Description: A laugh-out-loud, heartfelt YA romantic comedy, told in alternating perspectives, about two Indian-American teens whose parents have arranged for them to be married. When Dimple Met Rishi was EASILY one of my most ANTICIPATED 2017 RELEASES (Right below A Court of Wings and Ruin and King’s Cage) and now that I’ve read it, I can HONESTLY SAY that this book is EVERYTHING THAT I’VE BEEN LOOKING FOR. India has a long tradition of Arranged Marriages. (P.S: I’m Indian) It’s basically a set-up with the idea that both of you are looking to get married. STRANGE? Well, my Aunt and Uncle met at a hotel with their families and after FORTY FIVE MINUTES of talking, they decided that they should get married. They’ve been married twenty nine years and have two children. My mom met my dad once, and because their families had already decided that they would be perfect for one another, they got married. They never met despite the fact that they spent their lives living a street apart from each other, but they’ve been married for twenty five years. So when there was a YOUNG ADULT BOOK ABOUT ARRANGED MARRIAGES, HOW COULD I NOT JUMP AT IT? Reading When Dimple Met Rishi was SO EYE OPENING. I felt like I WAS MIRRORED in Dimple, her need for independence, to rebel from societal pressures and to FIND HERSELF IN A WORLD THAT HAS ALREADY TOLD US WHO WE’RE SUPPOSED TO BE. I had an INSTANT CONNECTION with When Dimple Met Rishi, and it made me realize how I’d NEVER SEEN MYSELF IN A BOOK BEFORE THIS – How I NEVER felt the need to be represented until this book and I LOVED EVERY MOMENT OF THE AWAKENING. 1. THE DIVERSITY: YAY FOR #DIVERSEBOOKS. The diversity in this is ACCURATE, with the religion, the parents, the pressure and the judge-y aunty-jis. I ADORED Dimple’s line of thought and how similar Dimple and I, and I felt like I understood a LOT OF PEOPLE BETTER after reading Rishi’s. THIS WAS SO WELL DONE. I CANNOT EVEN TALK ABOUT HOW HAPPY I AM THAT THIS BOOK IS GOING TO BE IN SO MANY HANDS SOON; THAT THIS WAS JUST WHAT I NEEDED TO READ. I LOVED IT. 2. ALL THINGS INDIAN: After I connected with Dimple on SUCH A PERSONAL LEVEL, all of the Indian things that came into this book made me feel like I WAS AT HOME. Whether it was the Bollywood item songs for the talent show, the KHATTA MEETHA MIXTURE (Which is my FAVOURITE and I one I haven’t eaten in so long) or the feeling of being dragged to boring family functions, THIS BOOK WAS COMPLETELY PERFECT IN ALL ASPECTS. 3. THE ADORABLENESS: EVERYTHING ABOUT THIS BOOK WAS ADORABLE, OKAY? 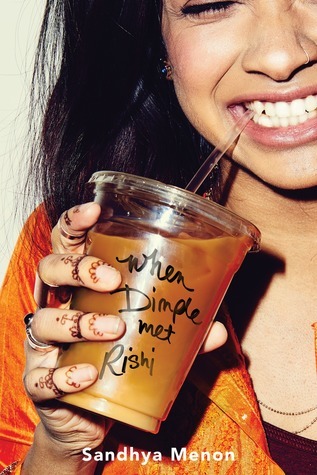 I absolutely loved the beginning with Dimple throwing her iced coffee on Rishi, how she slowly warmed up to him and his hopes and dreams about her. I loved their dates and the chemistry and how they just wanted the best for each other. #SWOON. 5. THE TWO SISTER BAR AND BOOKS: This is a book shop. And a bar. NEED I SAY MORE? Sandhya Menon and I have decided to live under a table now and I’ve totally booked my flight tickers. Bye now. An absolutely adorable, brilliant and addicting book starring two Indian American teenagers that will stay with you long after you’re done. My name is Sandhya Menon, and I’m a New York Times and national Indie bestselling author. I write books for teens (and those who still feel like teens inside!). I currently live in Colorado, where I’m on a mission to (gently) coerce my husband, son, and daughter to watch all 3,221 Bollywood movies I claim as my favorite. Also, I love my pets a little too much, as you can probably tell. My YA contemporary novel WHEN DIMPLE MET RISHI is out now. 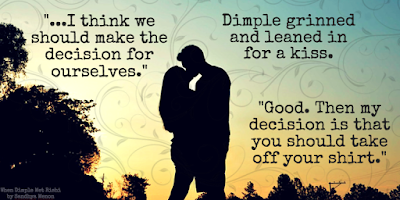 Buy here or add it on Goodreads if you like! HAVE YOU READ THIS BRILLIANT BOOK YET? If yes, please fangirl with me in the comments below. Who do you relate to more, Dimple or Rishi? What are some of your favourite #ownvoices books and #diversereads?